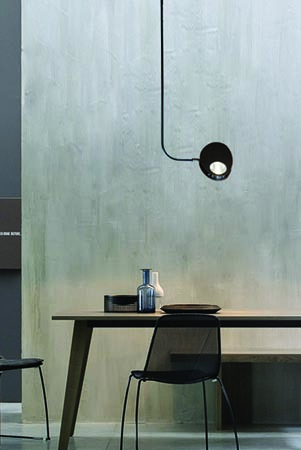 Designed with Carlotta de Bevilacqua, Scrittura brings a change into the light and surface integration paradigm. Light melts with space defining and describing its architecture, and even becoming a three-dimensional luminous support. Two basic modules – a luminous module and a dumb module – are combined into a potentially unlimited system. The former is a combination of two L-shaped elements, an aluminium frame and an optical methacrylate unit, which make up an object that appears as a luminous graphic sign, describing space through light. The white light of Scrittura clearly defines luminous surfaces and comes in two different emissions: asymmetrical wallwasher as a pure scenic light; symmetrical, diffusing, and controlled in the white version, suited for more functional scenarios. Based on a calculated optical proportion, only a small share of the emitted light is intercepted by the 45° edges, which act as formal distinctive traits of the project. Light is then driven along the methacrylate lighting guide, producing an inspiring luminous track in space. The enhanced mechanical joints in the project and a mains voltage power connection allow to create a free and unlimited lighting system starting from a single power output. The vision and perception of the product and of light act as a semantic texture of the luminous space by allowing a 360° combination of light emissions, both vertically and horizontally. In fact, direct and indirect vertical emission, as well as horizontal internal and external emission can be combined in a continuum. 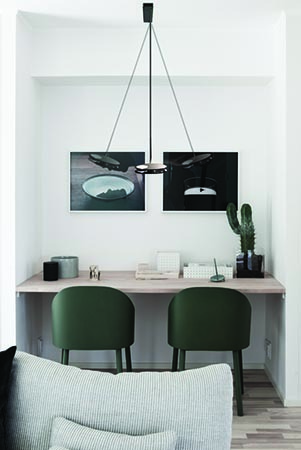 This option is available in all the versions – wall, suspension, and ceiling. The second basic module in the system is an extruded element that contains a vetronite printed circuit board. This creates a low-voltage safety track to which three appliances can be attached with magnets to perform the three main luminous tasks. A Lambert-emission half-sphere, a controlled-emission projector with three light beams (2X…, 2X…, 2X…), and a linear diffusing appliance become the lighting appendages of a mechanical structure that wriggles away in space and takes a broad variety of configurations and combinations. Each of these appliances can be locally dimmered upon installation by means of the special pin. 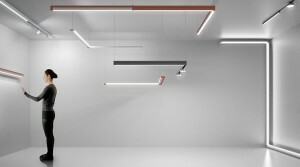 The safety voltage track module integrates both electrically and mechanically with the lighting modules, thus creating multiple diversified space and light landscapes in the suspension, ceiling, and semi-recessed version. 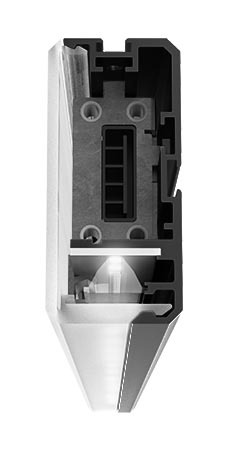 A next-generation control technology allows remote controlling of the Scrittura lighting modules using Hand Gesture – with simple, intuitive gestures codified by an on-board circuit, the whole scene or the individual modules can be switched on and off or dimmered. The element that characterizes Indra family is its head: an optical device that optimally serves functional requirements and enhances a variety of performances. Two specular silhouettes made by 4 mm thin of aluminum sheets contain two LED sources of 9W each, one opposite to each other, controlled by one switch. Thanks to hybrid reflectors and two different diffusers, the lighting emissions – direct and indirect – enhance two different beam: average (30°) and wide (56°). 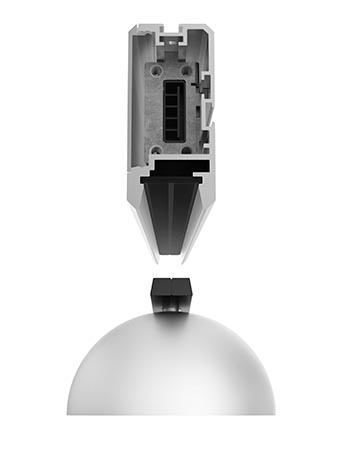 From a mechanical point of view, thanks to the ball joint, the user is free to choose how to direct lighting beams reversing the head with a simple twist. The shape of the head has a soft, rounded profile that encloses the optical components and the fastening system. It stretches towards the stem to accommodate the joint and create with it a thermal bridge that helps to ensure proper dissipation of the power used. 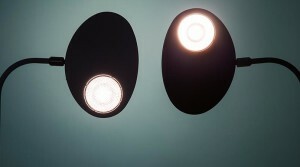 All necessary elements are visible and the optical ones enliven the profile of the head with a subtle touch of light. 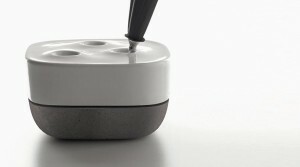 The stem has important functional prerogatives for all versions and it also adds style owing it to its elegant design. 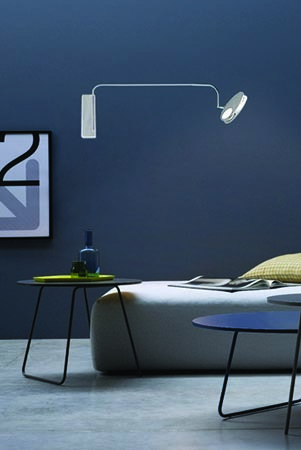 Indra is therefore a family designed to meet both ambient and operating light requirements. It is perfect for small spaces where it can by itself satisfy the user’s different needs. 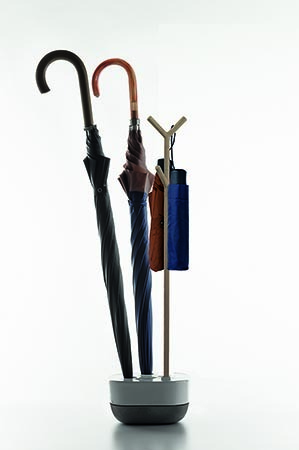 Vide is a ceramic and concrete umbrella stand designed with Paola Monaco di Arianello. The idea originated while observing the simple and instinctive gesture of putting an umbrella in its place, and develops into neutral elements that combine perfectly with the home space, recalling its construction material. 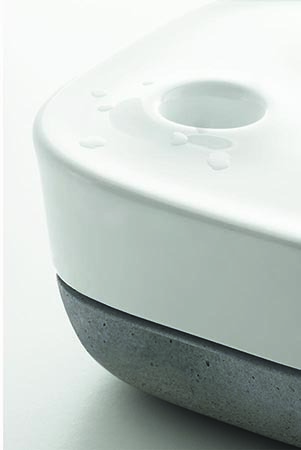 Ceramic and concrete were applied to the simple shapes of the two compositional elements: a soft cozy top, and a solid compact base. A wooden accessory completes the project: an element with straightforward lines that combines perfectly with the soft ceramic top. Telling gestures implicit in the surrounding space turns into easily understandable objects where design dissolves into a behaviour, and builds in this way a relationship with people. Technical description: umbrella stand composed by 2 overlap elements, white glazed cramic top and cement base. Perforated top to allow the insert of umbrellas. Also available with a decorative linear accessory in maple wood, natural finishing or white lacquered. 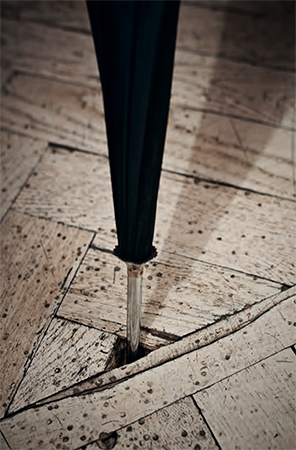 2 smaller molded accessories are applied to the frame, where to hang umbrellas or other (cm ø 1,5cm x h 80).